Find the perfect timepiece that will stand-out in time. To all the men out there looking for a minimalist watch, Treehut's Men's Rosewood and Ebony Wooden Watch with All Wood Strap Quartz Analog is made with push buttons, stainless steel and tri-fold clasp. It is handcrafted using real wood. The absence of chemicals and paint makes it earth-friendly and safe for the skin when worn. The strap is made from authentic wood as well, and the buckles are made from premium stainless steel. This watch is structured for great performance - perfect for the on-the-go men who consider time to be very essential. It is equipped with high quality Japanese Miyota watch movement that gives accurate and precise time. Since it is made from Rosewood and Ebony, this watch's over-all look is not just pleasing to the eye, but also highly durable. With this watch's wooden concept, it will fit any men's outfit. This watch's simple and classic design is suitable to man's taste, whether he is fashionable or meek. Rather than painted, its finish is a polished wood grain. No worries about the battery because it can last up until 5 years. The bands can fit up to 8.5 inches and can be easily adjusted for when you want that perfect fit. Give yourself a great timepiece that is ideal for any occasion. 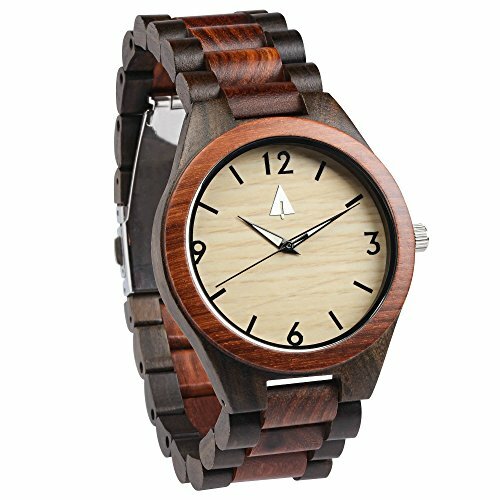 Treehut's Rosewood and Ebony Wooden Watch for men keeps you ahead of the times! 100% WOOD - This analog watch is totally Earth-friendly. It is created with real, bamboo wood and has no paint and chemicals included. It is crafted by bare hands of workers, making it extra special to wear. CLASSIC DESIGN - Men will definitely appreciate the simple and clean look of this watch. Thanks to a polished wood grain finish, the entire watch is smooth to the touch and comfortable to wear. With its trendy design, it can be worn with formal or casual outfits. It's a timepiece great for all occasions! JAPANESE QUARTZ MOVEMENT - Always keep perfect time! The Miyota time movement of this watch from is precise and dependable. It's great watch for men who always want to be ahead of their schedules. HIGH QUALITY - Only the finest materials are used for this watch, making it durable and great for longer use. This watch also has a 2-year manufacturer's warranty with every purchase. The tri-fold clasp of this watch is made from stainless steel and is also made with push buttons for hassle-free time adjustments. GIFT-READY - If you want to get a timepiece with excellent wrapping ready for gift-giving, Treehut has got you covered! It comes with a padded gift box when purchased. It's the perfect present for your boyfriend or male friend who considers timepieces to be an everyday essential. If you have any questions about this product by treehut, contact us by completing and submitting the form below. If you are looking for a specif part number, please include it with your message.